Does anyone remember Mr. R. B. Benedict who regularly made photos at sporting events and then handed them out at later games? He either gave them to someone he recognized in the photo or just handed someone a stack and told them to get the photos to the right people. 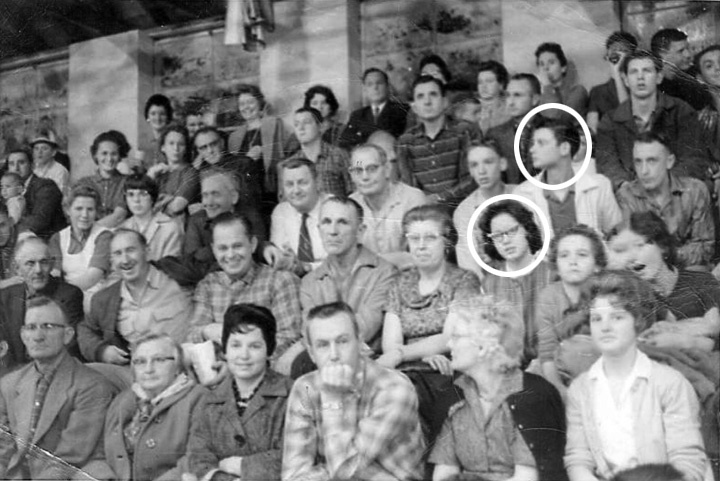 Seated over her left shoulder is her husband, Jim Culver! They had not met yet at that time ... in fact, they didn’t meet until the Fall of 1966, over four years later. In January 1962, Nancy was an eighth grader at MHS. Jim was a sophomore at Dresden High School, who often attended both DHS and MHS basketball games. They are still watching sports events together today ... more than half a century later! What are the chances that this photo was, first of all, taken ... second, landed in Nancy’s hands ... and third, kept all these decades in a memory box to finally surface and be noticed! Thanks, Mr. Benedict, for the memory!